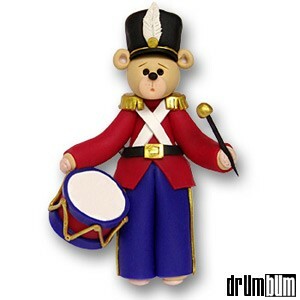 Marching Drummer Ornament – Add some extra Christmas spirit to your tree with a crisp, Marching Drummer Ornament! Brightly decorated with colorful paint, this Christmas tree ornament is sure to brighten any drummer’s holiday. A sleek marching bear, dressed in full marching band gear with snare drum. This bright, festive drumset ornament is the perfect decoration for your home this holiday season! Made from rubber. Approx. 4.25″ H x 2.75″ W.
Awesome Christmas Drums Gifts at DRUM BUM!